A middle-aged male was found down. EMS was able to get the patient to climb onto the ambulance by himself, then during transport he became less responsive. They briefly could not find pulses, and gave a short period of CPR with ROSC, but he did not require a shock. They gave Narcan without improvement. An oral airway was placed and BVM oxygenation provided. The patient arrived unable to provide any further history. BP was 180/100, HR 130, Oxygen saturations 84%. He was intubated. 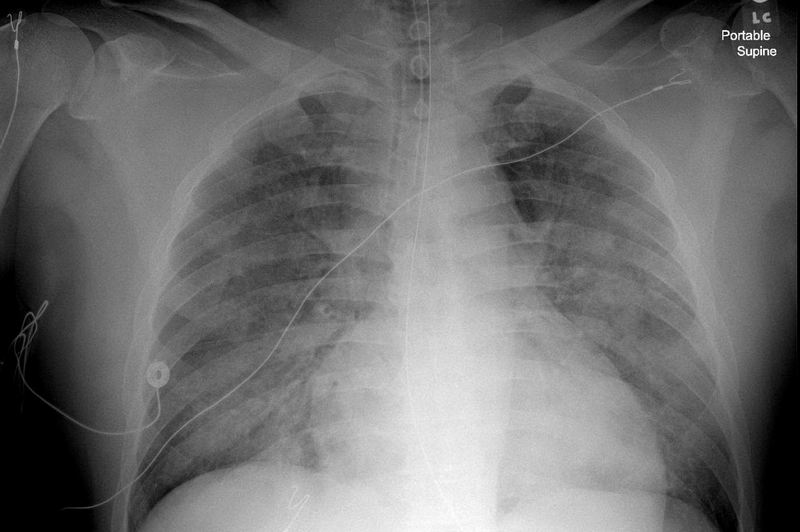 A bedside ultrasound showed poor global function and B-lines of pulmonary edema. There is sinus tach and left bundle branch block (LBBB). The ST segment in V3, as I measure it, is 10 mm, with a 38 mm S-wave. The ratio is 10/38, which is greater than 0.25, consistent with LAD occlusion. This meets the modified Sgarbossa criteria, which have been derived and validated. Should we diagnose anterior STEMI? Should we activate the cath lab? In both of the studies of the Modified Sgarbossa criteria, we excluded patients with extremely elevated BP, pulmonary edema, extreme tachycardia, or hyperkalemia. That is because these patients need supportive care and then, subsequently, a decision on the cath lab. This patient would have been excluded from the studies. Lactate was greater than 15. The patient was stabilized with supportive care. The respiratory acidosis improved with good ventilation. The lactate had time to metabolize. The patient was well oxygenated. The elevated BP resolved with propofol. By the time of the second ECG, the pulse was about 100, O2 sats 95%, BP 144/80. Supportive Care has resolved all the pathologic ST elevation. The Peak troponin I overnight was 2.382 ng/mL, consistent with NonSTEMI. Remains without obvious ischemia. It does not even show reperfusion T-waves. The next AM more data revealed a history of coronary disease with stent placement in the circumflex 3 years prior. Since then, he has had progressively worsening dyspnea on exertion, and orthopnea. Echo the following AM showed EF 35%, asynchronous interventricular septal motion (due to LBBB), inferior wall motion abnormality, LV enlargement, and LVH. It was unclear exactly what had caused acute decompensation. Hypotheses included brief dysrhythmia or ACS leading to shock and pulmonary edema. Given the coronary history and findings on TTE (inferior wall motion abnormality), ACS was high on the differential, and so he went for cath later that day. Cath result: total occlusion of a small right posterior descending artery (RPDA) which filled by left to right and right to right collaterals. No intervention was done because the artery was too small and the territory it supplied had good collateral circulation. The patient was later able to relate that he was having some SOB and trying to contact his doctor when he decompensated. He has baseline poor LV function with increasing heart failure symptoms, then had an acute occlusion of a very small RPDA which affected his LV function just enough to tip him over the edge into acute pulmonary edema. He was managed medically and did well. He was scheduled for cardiac resynchronization therapy (a biventricular pacemaker which improves cardiac output in patients who have LBBB with a QRS greater than 130 ms). Respiratory failure with hypoxia, hypertension, tachycardia, and acidosis can lead to profound ECG changes, in both LBBB and in normal conduction. Before making the reperfusion decision, stabilize the patient. Although in this case he did have a coronary occlusion, it was small and neither needed PCI, nor could be intervened upon. It was not the LAD, so these ECG findings had nothing to do with the very small coronary occlusion. Was the PDA acute or old? Brooks, it was acute, and thought to have pushed him over the edge. Interesting case Dr Steve, i have a few questions: 1. How frequently you see a patient with a heart failure presenting in your emergency service with hypertensive emergency? and 2. In what pathologies you think, excluding ACS, in this patient with this ECG and this clinic presentation? Thanks for the feedback. 1. we very frequently see heart failure patients with HTN emergency. 2. Anyone with LBBB who can go into pulmonary edema (h/o heart failure of any cause, or severe hypertension). What is the role of propofol in management of hypertension ? Propofol was used for sedation in this case, but it very much lowers BP by many mechanisms and was all the BP control that this patient needed. This is quite interesting, although somewhat confusing, because the first ECG gives really a true impression of MI over the LBBB. Agree that anyone needs stabilisation in the context, but I wonder how take the decision NOT to send such a patient to cath lab, after acute stabilisation, because he responds to many criteria of the actual decision AHA process in front of LBBB: LBBB + unstable, furthermore, LBBB + at least 2 Sgarbossa criteria (and LBBB + tropo up). Excluding after the fact-finding of a small blocked artery, I wonder why prospectively we wouldn’t send such patient in cath lab and in how many of them we would not find acute LAD obstruction. Do you use some timeframe? Let say: if ECG unresolved after X delay? Thanks for a pretty interesting case! Would modified Sgarbossa criteria be help for localizing the MI area and the culprit artery? Thanks. I do not think there is an MI "area" or culprit, though it is possible that there is a fixed stenosis in the LAD that, when there is high demand, restricts supply. Hi Dr, thanks for the case. Would following The chest pain protocol and after seeing the 12 lead in the field, would it be appropriate to a activate the cath lab prehospital? No one could blame you for activating, but you would look really smart if you said that the patient needs stabilization and then another ECG! Would he have benifited from nitro and morphine in pre-hospital care? If the BP is high, nitro is good. No role for morphine any more. Yes. Confusing but I tried to clear up the confusion by showing that you get false positives with pulmonary edema and other physiologic derangement. How much is extreme high BP, is more important the Systolic, dyastolic. Median or all? How much is extreme tach? For both cases and controls, patients with hyperkalemia (potassium 􏰃5.5 mEq/L), extreme tachycardia (rate 􏰃130 beats/min), severe hypertension (diastolic blood pressure 􏰃120 mm Hg), or pulmonary edema with respiratory failure, as defined by need for ventilatory support, were excluded because their ECGs commonly mimic occlusion and these patients would require intensive care, often including catheter laboratory activation, regardless of ST-segment changes. Thank you very much for this interesting case. Similar to some of the above questions, I'm curious about what precisely is meant by "too unstable for the cath lab" and "stabilize the patient," particularly in a code or peri-code patient. Dr. Mattu recently reviewed a proposed algorithm by Cai et al (http://www.ncbi.nlm.nih.gov/pubmed/?term=24016487) on ecgweekly (https://ecgweekly.com/2015/12/amal-mattus-ecg-case-of-the-week-december-14-2015/) which included your Modified Sgarbossa criteria for stable patients, but calls for any unstable patient with a LBBB to go straight to cath. I imagine the final decision would go to interventionalist, but what is considered too unstable for the cath lab? Is there any role for taking a pulseless patient to cath with an autopulse or lucas, or manual compressions? Or would there be any thought to lytics in the ED to attempt reperfusion without having to leave the ED? If not I assume stabilize means standard ACLS with epi and shocks + antiarrhythmics as indicated, are there any other strategies to stabilize the patient for cath? And if unable to achieve ROSC prior to a reperfusion attempt, would your only option be to call the code, or would you consider PCI, lytics, ECMO or other therapies at this point? I'm not sure where I said someone was too unstable for the cath lab. If I wrote that, I must have been half asleep. Did I? I'm sorry if I did and thanks for calling my attention to it. No, no patient who needs the cath lab is too unstable for it. The question is, does the patient need it? Is the patient's condition a result of severe flow limiting acute coronary syndrome? All too often, we EPs think that the cath lab is the answer when the problem is severe LVH, or severe hypertension, or a blown out valve. For some reason, we always think the answer is in the coronary arteries. Maybe instead it is pulmonary embolism, or aortic dissection. In the case above, it was not at all clear that the issue was ACS. As it turned out, the patients heart failure was PROBABLY tipped over by a tiny coronary occlusion, but it was even too small to do anything about it (no PCI possible). We take people to the cath lab on LUCAS compressions when we think it is due to STEMI. Thanks and good to hear from you. Thank you very much for your reply. For those of us trying to learn and improve our skills your site and your responses are a unique opportunity to delve into these issues. I guess where I got confused was the learning point "Before making the reperfusion decision, stabilize the patient." I took this to mean that this patient was considered too unstable for cath. However, if I understand your response correctly, it seems like you may choose to defer the decision about whether a coronary culprit is responsible for the presentation until the patient is more stable (or at least until stabilization for non-reperfusion interventions are attempted), BUT if at any point you feel AMI is the cause you would request a cath regardless of stability. Does that sound correct? If I have that right, I'm not sure how in this case the EPs could exclude a reversible cardiac lesion as the cause of the decompensation. The patient met modified Sgarbossa and had new onset florid heart failure with no known cause. You end the post with "It was not the LAD, so these ECG findings had nothing to do with the very small coronary occlusion." Is there something in the case (prior to the cath results) that should tip the EP off that cath is not the answer to this patient's problem? It does NOT meet the modified Sgarbossa because pulmonary edema and tachycardia can give false positives and these patients were excluded. That is the point of the case. The vast majority of patients with LBBB, severe hypertension, and pulmonary edema do NOT have ACS as the cause. That it all went away with supportive care says that either 1) it was not ACS or 2) it reperfused on its own and thus is not in critical need of emergent angio and PCI.